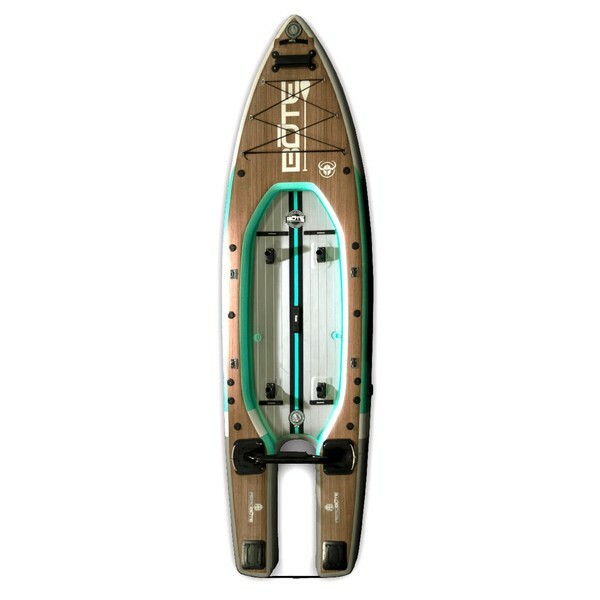 The BOTE Rover Aero Inflatable Stand-Up Paddleboard/Skiff is a combination of a paddleboard and skiff that can transform from travelbag to BOTE and back again. It is easy to store, can tag along on any adventure and stands up to the toughest tests on any waterway, or even a baggage claim. Constructed from military grade PVC using drop stitch technology the Rover Aero is not only virtually indestructible, but it's also rigid as a plank. Capable of supporting up to 500lbs of weight, Rover Aero can take a beating and still come out on top. Use the included Moto Rac to attach an outboard motor (up to 6 hp) that can transport you at speeds up to 16 mph. Motor sold separately. If you add a motor to the Rover Aero, then most municipalities, counties or states require the craft to be registered at your local tax collector's office or DMV. Also included is the AeroGo rechargeable pump that makes short work of inflating and deflating your Rover Aero. Just connect the hose, set the PSI and go. Don't worry about finding an outlet or hooking up to a car battery, the AeroGo will inflate and deflate your Rover Aero 2-3 times on a single charge. It comes in it's own convenient carry bag and fits inside the Remora Bag for transport with your Rover Aero. Travel Bag fully loaded: 85 lbs. Remora fully loaded: 24 1/2 lbs. Remora + Travel Bag fully loaded: 109 1/2 lbs.